Taped to my kitchen cabinet are instructions for taking care of my cats. Across the top are big bold letters that say: In Case I Die. I had two diabetic cats at the time, and it occurred to me that if anything happened to me, even if someone was nice enough to take my cats the cats wouldn’t make it because the person caring for them wouldn’t know all their insulin schedules, etc. When I wrote Waiting For My Cats to Die I made a blank version to give away as a promotional thing. I renamed it In Case You Croak because I thought for some people that was funnier and less upsetting than the idea of death. You can fill in information about your pets, what to do, who to call, etc. I scanned and made downloadable pdfs. Front. Back. 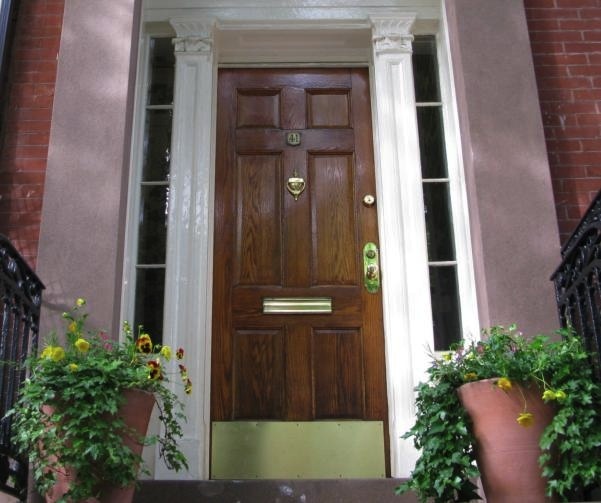 A picture of a door on 11th Street. I took this picture because I loved the super high gloss of the paint, which this picture doesn’t quite capture. That reminds me, Nora turned me on to Humans of New York. I can’t thank her enough, I love this site, the guy who takes the pictures, his pictures. It made me realize, I need to take more shots of people. I’m too shy to take the kind of pictures this guy takes though. LOVE Humans of NY, thanks for turning me on!!! Thanks for the pdf. Very useful! And HONY. Oh my. So great! I’m glad you like it. And Nora told me about HONY. Isn’t that guy great? ?